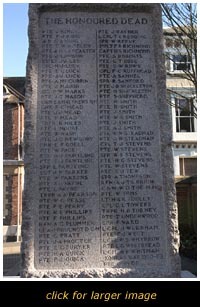 The Leighton Buzzard War Memorial stands in Church Square. 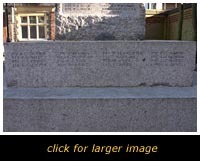 It is reputed to be unique amongst British Memorials, being at the time (and possibly still is), the largest single block of granite ever quarried in the British Isles. 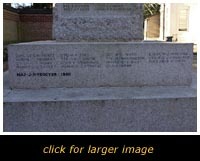 The block is 25 feet 3 inches high and 3 feet 2 inches square, weighing 22 tons. 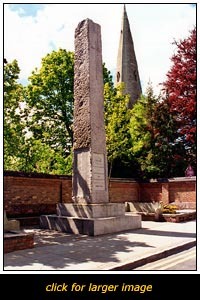 The Monolith was quarried in the Shap quarries about 1870 and remained in Messrs. Farmer and Brindley's yard at Westminster, until it was brought to Leighton in 1920. 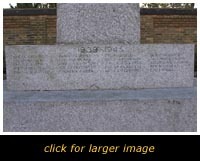 The erection of the memorial took three days to complete, and during this, Mr Harry Yirrell and Mr Fletcher Brotherton, placed a lead tube containing silver and copper coins of the realm, in a bolt hole at the base, directly under the centre of the granite block. 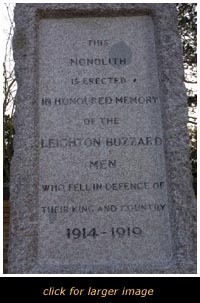 An unveiling and dedication service took place on the second Anniversary of Armistace - 11th November 1920. 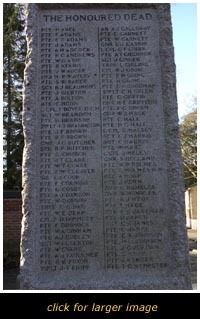 L. CPL. F. BOYCE D.C.M. C.S.M. E. R. MATTHEWS M.M. LT. A. J. POUCHOT D.C.M. C.S.M. W. D. TOE M.M.